Founded in 2002 by Teal Triolo, Sierra Rizing has become the heartbeat of this small community. We have grown from a simple coffeehouse and bakery to a catering, breakfast, and lunch operation. Teal and her staff go above and beyond when it comes to making your day or your event special. A wide variety of meals are offered from light to hearty, specialty pastries, grab-and-go items and so much more. Be prepared to be welcomed with a warm smile and a plethora of options to satisfy any palate. We enjoying creating food items you will be proud to offer your family, friends and colleagues. 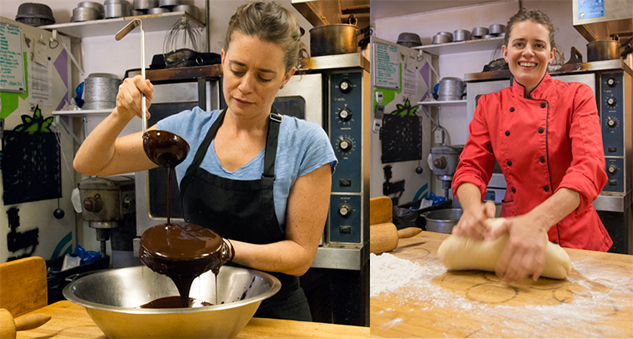 Teal demonstrates the hands-on knowledge she applies in the creation of a wide variety of fine foods and baked goods.